Managed by property owners (not managed by a management company). We live 1/4 of a mile from the property. The small residential village of Dresden has a nice village children's park with swings, a rocking horse, monkey bars and a jungle gym with slide; there is also a basketball and tennis court. 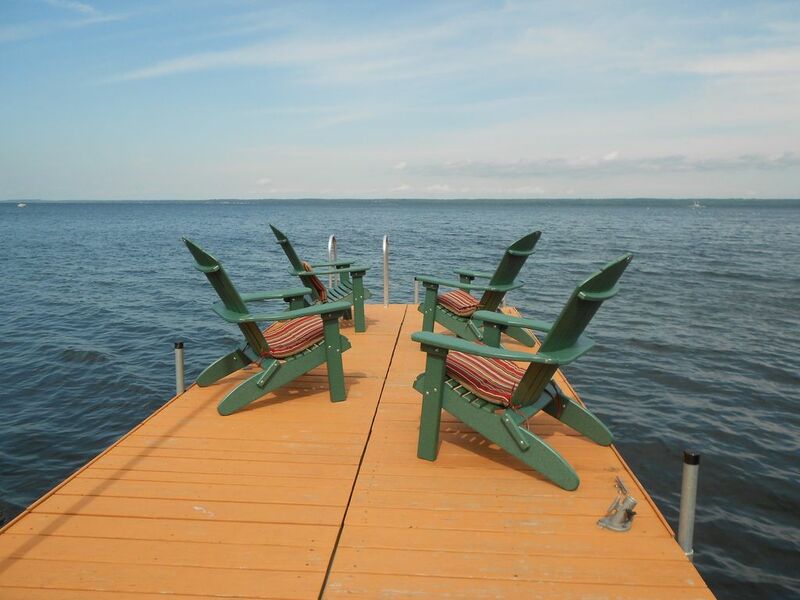 Expansive lake views you won't soon forget!! Protected cove makes for calmer water for swimming and boating. Linens, blankets and pillows provided. Full-size washing machine located off the pantry area near the kitchen. Washing detergent provided. Full-size dryer located off the pantry area near the kitchen. Towels, hand towels and washcloths provided (for indoor use only). Please bring your own beach towels. First floor is open-concept with sight from living room into the kitchen and dining areas, as well as of the lake through the sliding glass doors and deck. Nested ottoman with trays present. Refrigerator has an automatic ice maker with ice dispenser and chilled water dispenser in door. Ziploc bags, foils/wraps, paper towels and paper napkins provided. Some spices and condiments available from previous guests. Dishes, glasses, silverware and wine glasses provided. House also has crock pot, blender, mixer/mixing bowls and storage containers. First floor is open-concept with sight from dining area into kitchen and living areas, and of the lake thru the sliding glass doors and deck. Dining table extends to 10 feet. High chair upon request. Compact HiFi shelf system with radio, CD, IPod docking, USB input and wireless remote. DVD player and PlayStation3 available. Game area in the lower level has a multi-game table that includes foosball, air hockey, ping-pong, chess, shuffleboard and more. First floor bookshelf contains various board games. New lake side 18 x 16 patio accessible from the lower level sleeping area and the sidewalk on the south side of the house, with steps to the beach and dock. Linda was an amazing host from start to finish and the house was fully equipped and then some. The furnishings made for a relaxing time for us and our close friends, creating more wonderful memories together. I would absolutely rent again and have already given a referral. Thank you Linda for being such a great host and creating an atmosphere of comfort and home. Highly recommend! We are so glad you had such a good time at the house - we love sharing the house so our guests can make memories - that is the best part of life! Our hope is that the house does create an atmosphere of comfort and home, so thank you so much for confirming we are on the right path. Rang in the new year with old friends here, was just what we needed! Perfect for a group our size and had everything we could ask for. So much fun to bring in the new year with family and friends. Glad the house worked for you!!!! House was very large and clean! We had a great time staying there! We are so glad you had such a great time, and that you found the house was big enough for your group to enjoy!!! We can not say enough good things about Dreaming a View. First the owners Phil and Linda were great to work with. Their property is absolutely stunning and incredibly clean! The house had everything we could have possibly needed and more. The owners really have thought of every detail possibly. A group of 8 of us stayed for the Deck the Halls weekend and we all can't wait to stay here again! Thanks again Linda and Phil! Thank you so much - we are so glad you enjoyed the house and it had all that you needed!! We really enjoy working with our guests so they have the must fun and relaxing time!!! Come again!!!! Dreaming a View was a dream! away week with our friends - close to wineries and several great bike trails. Loads of room and beautiful decks to sit on to enjoy the lake. We are so glad that you enjoyed the house with it's amenities and closeness to wineries and other local activities. We really enjoy making our guests our friends and family. Fall was the perfect time to enjoy this beautiful home on Seneca Lake. It had everything you could want. The house was spacious and comfortable. The kitchen was well equipped. The fire pit by the lake was a great setting for good friends and wine purchased at our favorite wineries. We agree, Fall is a perfect time to visit 'Dreaming a View' - sitting on the dock or by the fire pit, enjoying wine and the fall colors. Glad you found the house had everything you could want, and was roomy enough for your family and friends.